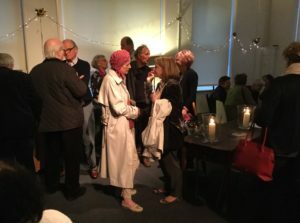 Clapham Book Fest 2018 How’d it go? The dust has settled, the crowds have gone home and everyone involved with delivering the Clapham Book Festival 2018 takes a hefty breath. Sigh. It was very hard work. We had twice as many events this year as last and in two venues, probably too many events, to be absolutely honest. The day had dawned fair, but not too hot, which was remarkable given that the weekend which preceded it and that which followed saw temperatures up into the high twenties/low thirties. We would have had no chance in such circumstances, no one would have chosen to come indoors. But it was pleasant, with a chance of showers. We met at nine in the morning at Omnibus Theatre, in my case carrying the cash float, a pile of Feedback sheets, the Festival banner and additional T-shirts for our new volunteers. Fortunately I had help from Sponsorship guru, Bertie, who lives just around the corner. On arrival we began to set up the tables for book selling and book signing – we had over three hundred books this year, all transported by the trusty ( not to say saintly ) Director of Books, Dave, who had collected them from Clapham Books the day before. Bertie and Dave were joined on the book stall by new volunteers, Sue and Andrea, both of whom put on their T-shirts. Two of the Trustees and Paula, our Programme Director, then set out across Clapham to the Library in the High Street, to greet our first author, prize-winning Patrice Lawrence, whose session started at ten. Meanwhile Adam had arrived at Omnibus to help shift furniture in the theatre and the lounge/bar, while John, our Technical Director, was deep in conversation with Paul, the technician. Slideshows flitted across the back screen, lights dimmed and rose, the dais at the front of the auditorium took shape, acquired chairs and microphones and a stand for flowers. Our secure dressing room began to fill with items. The handmade chocolates to be given as small gifts to the authors were placed therein in their little bags ( thank you Macfarlane’s Fromagerie ) as were personal items. The book stall and the performance space were taking shape. 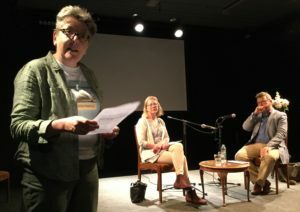 Our first speakers, Emma Darwin and Philip Gwyn Jones arrived and drank coffee, they were speaking at eleven. But there was some embarrassment – Emma had stepped into the breach at the last moment when Lucy Luck had to pull out and, while the Programme had been up-dated by Omnibus, her image had not be put up on Omnibus web-site. Additionally the Programme page on the CBF web-site still listed Lucy (although the Authors page had replaced her with Emma). Profuse apologies, Emma was very gracious. This year it fell to me to open the first Omnibus session, which I did, to the clicking of Penelope’s camera (well, tablet). Then the lights went down and I sat back to enjoy a really good discussion on writing and publishing. So did an appreciative audience. And then it was on to the next item – the poets had already arrived and were waiting outside. Thus the day passed, always busy, always looking to the next item, occasionally taking a break while helping rearrange books in a newly quiet lounge area, while a session was going on in the theatre. The items which I saw were excellent, the speakers really engaged with the audience and with each other, sometimes proving quite revelatory, always insightful. 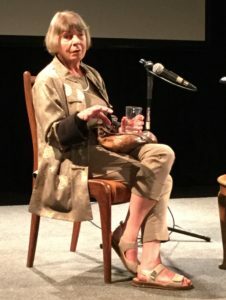 By late afternoon, when the rain came down ( and didn’t stop ) the theatre had seen good sized audiences, especially for Dame Margaret Drabble. One lady had come from the Midlands bearing her 1972 copy of The Millstone, which Dame Margaret duly signed. As people began arriving for the evening session we prepared to move the book stall from the lounge into The Greene Room for the final, informal event with music and for people to have their most recent book purchases signed by Deborah Moggach OBE. All set up in the new room. we heard Elizabeth give the closing speech, as the musicians began, quietly, to play and the doors at the back of the theatre opened. The audience poured out, to buy more books, to have a drink at the pop-up bar, to talk about the Festival. 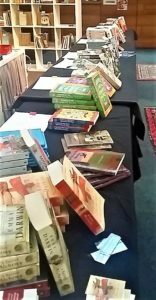 Local authors came along, Annemarie Neary (The Orphans, Hutchinson 2017) Brian James ( Dangerous Skies, Claret Press 2016) and Bobbie Derbyshire (Oz, Cinnamon Press, 2014) were the ones I spoke with, but there were plenty of others. Lots of Festival goers told me how much they had enjoyed it, many people attending more than just one event. Job done. 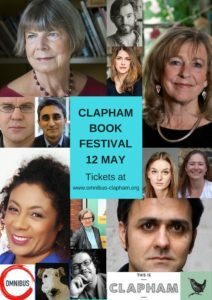 If you want to read more about the Clapham Book festival 2018 try The Writing Game. Or take a look at the photographs here. This entry was posted in Clapham Book Festival and tagged Clapham Book Festival by juliej. Bookmark the permalink.